SINDHUPALCHOWK, May 1: Earthquake victims in Sindhupalchowk have been increasingly attracted towards integrated settlement. The attraction is fueled by the benefits of such settlements and the strong bonding they have developed among themselves during their communal stay post quake. While two of such model villages are already constructed, construction of ten more is underway. Acknowledging the wish of the victims, the National Reconstruction Authority (NRA) has also furthered its construction projects in the similar way. “Integrated settlement or community living is very good. For social harmony, help, support, for facilities, for quality life, such kind of society is far better than building houses apart,” said Tanka Gautam, chief of Urban Development and Building Division. “The quake victims understood it very well after the disaster. So, they are very keen to build such a society,” he added. Following the 7.8 magnitude earthquake and its aftershocks 13 districts including Sindhupalchowk saw massive devastation. Houses and other infrastructures turned to rubbles while hundreds were killed and many injured. Post earthquake, survivors lived in community camps and makeshift shelters. “During their stay as a community in makeshift shelters and camps, quake victims were able to connect with each other and during this period they were able to better understand the value of community life. They realized what it means to be for each other, to live in harmony. In a way, they learnt a great lesson,” noted Gautam. “Moreover, if they made individual houses apart from one another, everything would be costlier. So, integrated model in now very much in demand,” he added. Most of such model villages are now built in the initiation of the quake victims alone. Few facilities are common in such models - wide roads, drinking water, toilets, and disabled friendly infrastructures, playground for children, parks, health center and open spaces for common use. Similarly, houses and other infrastructures are built and colored in similar pattern. “Reconstruction authority is going to support such villages as much as possible. When people themselves are so eager and aware, no wonder the government should extend helping hands,” Gautam stated. “When houses are apart, it is difficult to ensure facilities for each of the houses. In integrated settlement, it's a different matter,” he added. According to Gautam, the NRA is providing Rs 350,000 per house in plains, Rs 500,000 in mountains and Rs 400,000 in hills if 10 houses are built at once in integrated model. “We are promoting construction of such settlements to foster integrated living,” he said. First of such integrated settlement model was built in the district at Shikharpur by the Thai Nepali Association. The association had built 46 houses for Majhi community. These houses have one single big rooms, which the inhabitants were able to divide and make into three rooms. All of the houses are painted with blue colors and were sheltered by corrugated sheets. Though it's a one room house, each house has separate toilet as well as safe drinking water facility. Majhis living here are more than happy, they say. 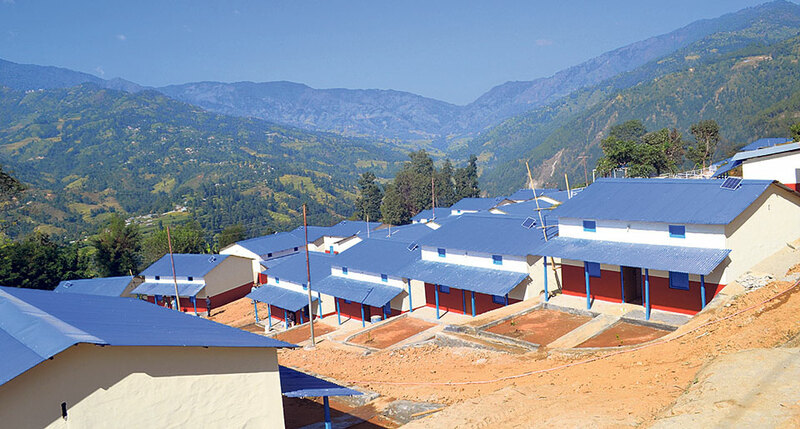 The Dhurmus Suntali Foundation built second of such integrated settlement in Giranchaur. The foundation built 65 houses with all basic facilities available. The foundation had reported that it invested over Rs 50 million collected from Nepalis living here and aboard for the project. The duo had stolen massive media attention as the foundation after completing the project in just four months. “After the two integrated settlement came in existence here, people were quite motivated. They could see the difference. So, now more of such settlements are being developed in the initiation of the victims alone,” said Rajkumar Bhattarai, president of Tourism Promotion Project. In the initiation of quake victims, Tourism Promotion Project and Community Reconstruction Committee have been building 135 houses in integrated model in Giranchour. While 110 houses are near completion, construction of other houses is presently underway. According to Bhattarai, the settlement is built in 170 ropanis of land and will have all modern facilities. Each of the four-room houses is being constructed in RCC model. “Cost of each house could reach Rs 1.8 million. Funding for the project is covered from the government's grant, our support and Rs 500,000 from victim and donations from organizations that are willing to support the project,” Bhattarai said. The project kicked off in August and is expected to be completed in a year. Chaudhary Group has also started working on such project. It has started to build 72 such houses in integrated model in Giranchaur. For each house, it has allocated Rs 500,000. Yet another integrated settlement is being developed in Talamarang. The project's manager, Gyanprasad Sigdel informed that 24 houses of the same model are under construction. During their stay as a community in makeshift shelters and camps, quake victims were able to connect with each other and during this period, they were able to understand the value of community life.